How to rip DVD to iPhone 4 on Mac? Home » How to rip DVD to iPhone 4 on Mac? “This changes everything. Again.” As it advertised on Apple official site, unveiling of iPhone 4 brought with so many amazing facilities. The FaceTime video call, retina display, HD video recording and editing, all of these make our life easier and simpler with the new generation of iPhone 4. The iPhone 4 offers both 16GB and 32GB model, either of them can be used as a portable media library. So why not rip your DVD collections to iPhone 4 and enjoy the high quality videos on the 960*640 display? Now with Pavtube DVD to iPhone Converter for Mac you can easily rip DVDs to iPhone 4 and travel with your DVD movie library. The powerful and user-friendly Mac DVD to iPhone 4 Converter produces videos up to 1280*720pixel, avoiding much quality loss during en-decoding process as many other converters bear when transcoding DVD to iPhone 4 formats. You may download the trial version of the DVD to iPhone 4 Converter and give it a shoot. There is not any time limitation, but please note that the trial converts video with a Pavtube logo watermark on the screen. Now please refer to the following guide how to convert DVD to iPhone 4 with Pavtube DVD to iPhone Converter on Mac (MacBook, iMac, etc). Step 1. Load DVD for conversion. Insert your DVD in Mac, run the DVD to iPhone Converter, click “DVD Folder” and browse to the DVD movie you’d like to convert, click “Choose” to confirm. The DVD movie is displayed in a directory. Click the triangle arrow to expand the directory for checking movie chapters. Basically the main movie is included in the first Title, so you can right-click, select “Uncheck All” and then check the first title only. Now you got to select audio track and subtitle (if necessary). Click on the Audio box and select an audio track with desired language. Set subtitles in the same way. Always note that you got to check the chapter before setting audio and subtitle. By default there will be no subtitle at all. When setting audio and sub, you can view the movie clips from the Preview window. Simply select an item and click the “Play” button. When the video is playing, you are allowed to take snapshoot. Just click the “Snapshoot” button when it plays to your favorable frame. Step 2. Select iPhone 4 optimized format. The Pavtube DVD to iPhone Converter is capable of converting DVDs. It is capable of converting DVD to iPhone, iPhone 3G, iPhone 4 and some other video and audio formats like WMV, AVI, Divx, MKV etc. Since we are converting DVD to iPhone 4, you can click on the “Format” bar, find iPhone group and select desired output format from the profile list. 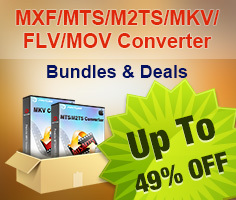 There are H.264 and MPEG-4 encoded MP4 and MOV formats up to 720p for your choice. Customized video formats for iPhone 3G and iPhone first generation are available too. You may customize video and audio parameters in Settings panel as well. Simply click “Settings” button to and set the bitrate, frame rate, channels, sampling rate as desired values. Step 3. Set output location. Click “Browse” button and specify an output folder to save converted files. Click “Choose” to confirm. Step 4. Convert DVD to iPhone 4. 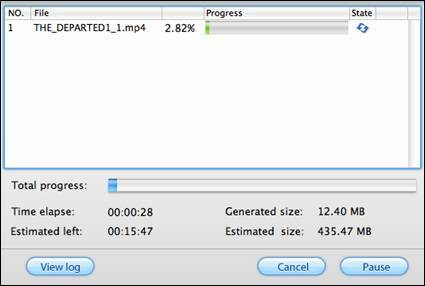 Click “Convert” to start converting DVD to iPhone 4 compatible format when everything’s done. The Mac DVD to iPhone 4 Converter supports auto shutdown so you may set auto shut down before conversion starts by entering “Option” window and check the box of “Shut down the computer after conversion”. When the conversion completes you may click “Open” button to find generated MP4/ MOV files and sync DVD movie to iPhone 4 with iTunes so as to enjoy the movies whenever and wherever you like. Tip: The DVD to iPhone Converter features some editing functions for you to organize the videos. 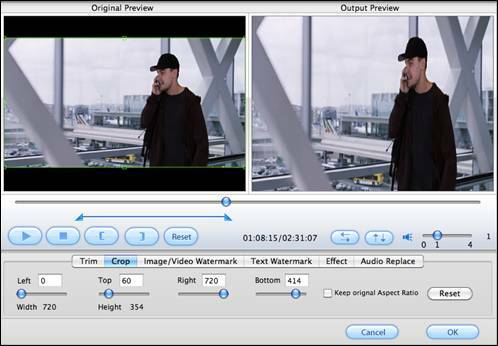 You may crop, trim, watermark selected movie clip at your disposal in Editor window. To enter the Editor interface, simply click the “Edit” menu. If you wanna share your videos or have perfect movie-watching experiences at home, you can make use of Apple AirPlay to watch movies on your wide screen TV via Apple TV 2. How to Record HD videos with the iPhone 5?